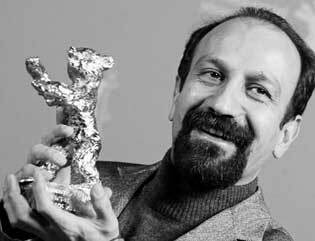 Since About Elli, which was made by Asghar Farhadi two years ago, had won a silver bear for the best directing from Berlin Film Festival, many people looked forward to seeing the achievement of his next film, Nader and Simin: A Separation, in the 61st edition of the same festival. Few, however, expected so many prizes that it actually won: a golden bear for the best film, a silver bear for the actor and another silver bear for the actress. This proved that Farhadi’s new film had greatly appealed to Berlin Film Festival’s jury. Farhadi did not expect the foreign audience to understand the film as Iranians do because parts of it are based on pure Iranian customs and beliefs. However, the totally human idea which formed the core of the movie greatly appealed to both the judges and festival’s directors. Nader and Simin: A Separation also won many prizes from Fajr International Film Festival. It has powerful rivals in Berlin, the most important of which was Béla Tarr’s The Turin Horse. The Turin Horse won jury’s special award (a silver bear) and the silver bear for the best directing was given to Ulrich Köhler for Sleeping Sickness. In addition to the aforesaid awards, Nader and Simin: A Separation also won the prize of independent judges of the festival. After watching the film, the viewers applauded Farhadi and his entourage for a few minutes. The same happened in the closing ceremony. After that unprecedented achievement, Memento Films sold Farhadi’s films in many countries. it was screened in France, Belgium, UK, the Netherlands, and Switzerland during spring and summer. Nanni Moretti has also acquired the film’s distribution rights for Italy. In addition to that festival, Farhadi’s film has been screened in other festivals. Back in Tehran, Farhadi was received by officials of Farabi Cinema Foundation. Alireza Sajjadi, director of the Foundation reflected on Farhadi’s success in Berlin by saying, “Receiving awards from Berlin by a film which had been given awards only three or four days before by the Iranian jury (of Fajr Festival) shows that foreign festivals follow suit with Fajr Festival and the time for mudslinging the Iranian films has come to an end.” Sajjadpour, who had already stopped production of Farhadi’s film for a short time due to his remarks about Mohsen Makhmalbaf in a cinema ceremony, also indicated his dissatisfaction with the support given to Farhadi’s film by Berlin Film Festival. He indirectly chided Farhadi for having mentioned Makhmalbaf’s name. At the same time, many independent film institutions of Iran celebrated Farhadi’s success and appreciated him and his crew.